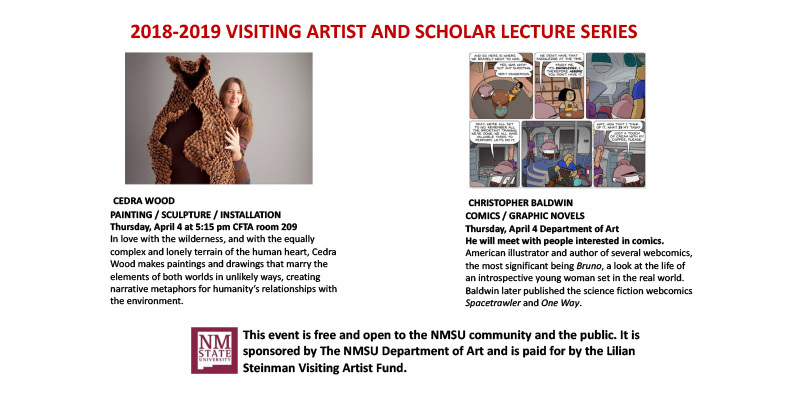 NMSU Department of Art welcomes Cedra Wood and Christopher Baldwin to the NMSU Main campus on April 4th. Cedra Wood who is from Albuquerque, is currently an artist-in-resident at the internationally known Roswell Artist in Residency program in Roswell, NM. She will give a talk about her work at 5:15 on Thursday, April 4th in Room 209 in the Creative Fine Arts and Theatre building, room 209. Christopher Baldwin, is a comic book artist and will be meeting with students who are interested in talking with him about his work and the industry. In love with the wilderness, and with the equally complex and lonely terrain of the human heart, I make work that marries the elements of both worlds in unlikely ways, creating narrative metaphors for humanity’s relationships with environment. I received my MFA from the University of New Mexico; have been a research fellow at the Center for Art + Environment at the Nevada Museum of Art; received grants from the Land Arts Mobile Research Center and the Elizabeth Greenshields Foundation; and participated in residencies in North America, Australia, and the Arctic. This entry was posted in Visiting Artist. Bookmark the permalink. Follow any comments here with the RSS feed for this post. Both comments and trackbacks are currently closed. « Students win at Yuma Art Symposium!